Defender not good enough & Coventry scenes ugly with "blood stains all over the car park" - Ethan's Away days & Player Ratings! 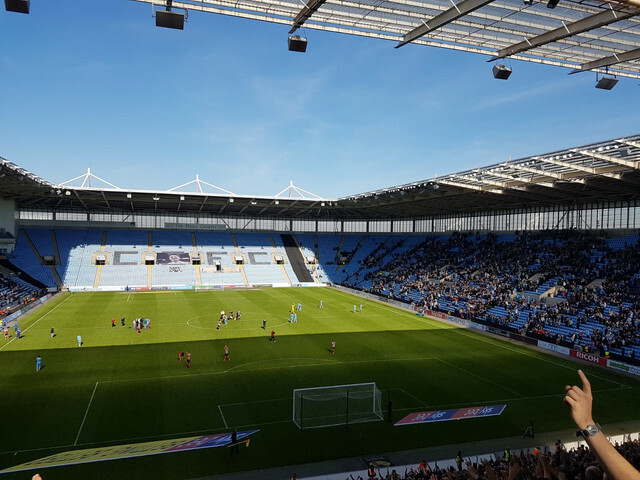 Sunderland travelled to Coventry for Saturday’s early kick off at the Ricoh Arena, backed by 5000 Mackems who’d made the journey. Jack Ross opted for youngster Denver Hume at left back, keeping out the Costa Rica international Bryan Oviedo; Max Power made a return from suspension but only made the bench. Anyone who had travelled down by bus, like myself, would’ve realised that there wasn’t much to do around the ground before kick off. There was a casino and bar attached to the Ricoh itself but, apart from that, a retail park just across the train tracks, a Subway, Frankie & Bennie’s and a Tesco was about as much as it had to offer though. Nevertheless, I chose Tesco’s café for an overpriced breakfast and a bottle of Oasis. The ground itself isn’t what you’d call inspiring. The Ricoh Arena is similar to how I described Reading as last season: the Riverside but with different coloured seats. The stadium is too big for a club the size of Coventry, the North Stand, opposite us, was partially covered by a flag of Jimmy Hill and then a sea of sky blue seats. The seating was also, in my opinion, stupid! There were about 15 blocks in the South Stand and each block was numbered 1-20 and so on, because it’s too simple to number the seats from 1 until maybe 300 etc. half of the stewards didn’t have a clue either to be fair. In the first few minutes before anything had really got going, central defender Glenn Loovens had to depart due to injury – a big miss for the next few games – he was replaced by Adam Matthews. The first half was rather boring and if anything dominated by the home side. The officials didn’t really help us either, some clear fouls not being given in favour of us tand questionable decisions given against us, including what looked a dive or two. Both teams had half chances in the first 45 but nothing to really shout about – we were let off just before the break thanks to Jack Baldwin dealing with the danger as he so often does. The first half had eight additional minutes added on, the majority of that coming from injuries on both sides, including Hume who was replaced just before half time. The entertainment came second half after just four minutes, some good work down the wing by the fantastic Chris Maguire and Matthews, a great ball was played into the area to pick out Lee Cattermole who finished well beyond the helpless Lee Burge. It was an accomplished strike from the central midfielder, who is not renowned for his goalscoring. We came close minutes later when a similar ball was played in by Lynden Gooch from the same flank, but Josh Maja tried to dummy the ball instead of taking a touch and hitting it, unfortunately nobody was there. We were let off soon after and seemed on the back foot ever since Maja's opportunity, Conor Chaplin and Clarke-Harris both had chances with the pick of them being scuffed wide past Jon McLaughlin’s goal. The goal did come through a similar move to the aforementioned missed opportunity and this time Clarke-Harris didn’t miss. He rolled it past McLaughlin. The next goal was going to be Coventry’s if it came despite Cattermole coming close. The home side were on top. McLaughlin was called into action a few times after that with chances for Clarke-Harris, Chaplin and Shipley all being punched away by the former Hearts man. Not the best at collecting the ball but a fantastic shot stopper and decent with his distribution. The key incident in the second half was when Flanagan misjudged and allowed Chaplin to run clean through, one on one with the goalkeeper who got a touch on the former Portsmouth frontman’s shot, Chaplin thought it was rolling in but Baldwin recovered and cleared it off the line. Burge was also called into action to stop the visitors taking all 3 points back to the North East – George Honeyman, Gooch and Maguire all forcing saves from the keeper who was determined not to let the point slip. We were dreadfully unlucky to lose three players to injury, those being Loovens, Hume and Gooch. Lee Cattermole will also serve a one game suspension following his 5th yellow card. Max Power came on and made a cameo, but wasn't game changing, after he replaced Dylan McGeouch second half. Personally, I though Matthews had an awful game and has never looked up to scratch, Hume looked more comfortable on the opposite flank and then Oviedo when he replaced the academy graduate. Not only that, Hume looked a lot better than Matthews when he played right back against Fleetwood Town. Flanagan looked comfortable in the centre of defence as well as out on the right but Jack Baldwin is the heart of our defence and looks at ease. Post match there were some ugly scenes between Coventry and Sunderland fans, the home supporters had decided to break down the Police barrier and attack the Sunderland fans getting on their buses. Two coaches had their windows smashed and a few broken noses too as well as blood stains all over the car park. It was more like a football hooligan film from the 70s or 80s than 2018 with all the violence and rocks flying around. McLaughlin: 7 – made some game changing saves but couldn’t gather the ball. Flanagan: 6 – looked solid at the back, although his mistake towards the end nearly cost us. Baldwin: 8 – quality made everything look easy, did well to recover and clear Chaplin’s shot off the line. Hume (Oviedo ‘37): 6 – looked alright but still needs time to develop. Cattermole: 9 – outstanding again, great prolific finish and was spraying balls about the park like Pirlo! McGeouch (Power ‘66): 5 – wasn't great and likes time on the ball, could’ve done better. Honeyman: 6 – unlucky not to score; still not a captain in my opinion. Gooch: 6 – good going forward but ball greedy, disappointing to lose him through injury though. Maguire: 7 – ran after everything, challenged for everything and set up Catts’ goal nicely. Maja: 5 – didn't do a lot to judge him for although he held the ball fairly well, he should’ve scored though. Matthews: 4 – awful and just seemed way off the pace. Oviedo: 5 – good going forward and average defensively. Power: 5 – didn't have much to judge him by to be perfectly honest. Thank you for reading and keep your eyes peeled for some more ‘On the Grill’ interview pieces coming soon – tweet me @ethan_thoburn to share your thoughts.